The Scottish Vocational Qualification (SVQ) 4 in Hospitality Management Skills at SCQF level 8 can provide a clear progression route for candidates who have reached supervisory level in the hospitality industry or have completed qualifications at SCQF Level 7 and above in Hospitality in further and higher education. It will offer both the existing workforce and new entrants the opportunity to progress into management roles in the hospitality industry. The SVQ in Hospitality Management Skills at SCQF level 8 is an addition to the existing suite of SVQs in Catering, Hospitality and Professional Cookery. The SVQ is designed to be assessed in the workplace, or in conditions of the workplace in any aspect of the industry, or as part of a Realistic Working Environment (RWE) within a centre. Criteria for RWE are set out in the assessment strategy developed by the Sector Skills Council, People1st. The assessment strategy is available on the SVQ Hospitality subject page. 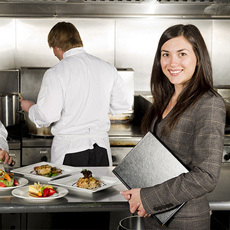 This SVQ is suitable for candidates who are working at senior levels in a range of sub sectors and job roles, such as Heads of Departments, Kitchen Managers, Head Chefs, Accommodation Managers, Executive Housekeepers, and Food and Beverage Managers, as well as managers in small businesses and owner operators. Entry is at the discretion of the centre. This is a work-based qualification, so candidates should be in a job role that enables them to provide the required evidence in a working environment. Management and leadership roles in the hospitality sector, including marketing and retail. Centres should pay particular attention to the requirements set out in the assessment strategy if operating qualification via an RWE. The SVQ in Hospitality Management Skills at SCQF level 8 is an occupational qualification whose purpose is to assess a candidate’s competence. In each unit there are performance criteria that describe what the candidate must be able to do in a real work environment. It is expected that evidence for this SVQ will be generated from real work activity in a hospitality workplace. In some circumstances, evidence of the candidate’s performance can come from a Realistic Working Environment (RWE). However, RWEs must meet the guidance provided in the Assessment Strategy. This SVQ is a mandatory component in the Level 8 Technical Apprenticeship in Hospitality Management Skills.